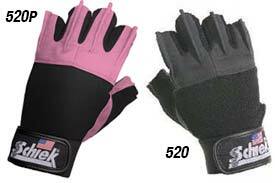 Schiek produces the top of the line gloves and the model 520 is their premium gym glove. AsThe Schiek 520 Premium Series Gel Lifting Glove is a glove that is constructed from the highest quality materials which gives the user maximum hand protection and durability. The Schiek gloves is made from Amara synthetic leather which is a light breathable fabric that won't stretch and is machine-washable. 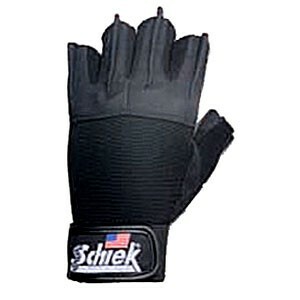 This glove provides the perfect non-slip grip for weight lifting exercises of all kinds. The gel padding provides extreme comfort, energy absorption and vibration reduction. The 520 model glove provides double-stitching and additional reinforcement in critical areas and the special keystone thumb feature provides a much better fit around the thumb area. With Schiek’s patented and innovative easy-removal fins, getting your gloves off after a workout is no longer a problem. Simply grab the rugged fin extensions on top of the fingers and pull for easy release. 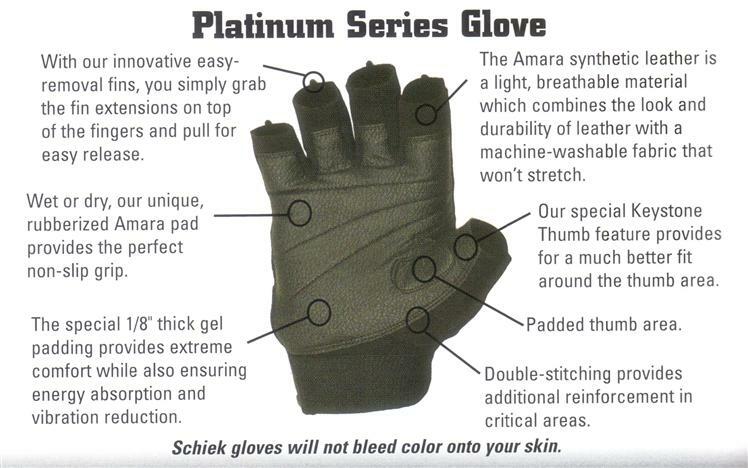 Schiek Premium Series Gel Lifting Gloves can be thrown in the washer to clean them up for your next workout. Schiek gloves will not bleed color onto your skin. The Schiek® 520 women's Platinum lifting gloves showcase the easy-removable FIN system that let's you simply grab the fin extensions on the top of the glove to easily pull it off. Each glove is constructed with a Amara synthetic leather, a durable non-slip padded palm and thumb and thick gel padding. Call 1-800-875-9145 to speak with one of our fitness advisors with any question you may have about any of our Schiek products. Order your Women's Gel Lifting Gloves Model 520 from FitnessZone.com today!